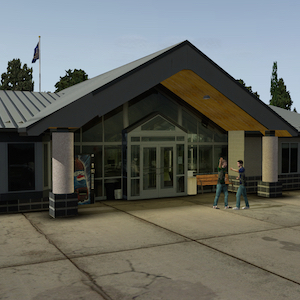 KFYJ is an interactive Animated HD Photo-realistic airport developed by Marc Leydecker a.k.a. Belga12345. This picturesque KFYJ (a.k.a. West Point) took me over 1400 hours to build this photo-realistic HD airport. All objects, including vehicles, static aircraft, buildings, vegetation, animations, etc. were made in Sketchup and based on pictures I took. Please explore, there is a scene and surprise around every corner. You may NOT upload Belga’s KPVG, whether or not modified, in whole or in part, to any file distribution system, reverse engineer, disassemble or de-compile any part of Belga12345’s KPVG for any purpose other than to implement improvements for your own personal use.